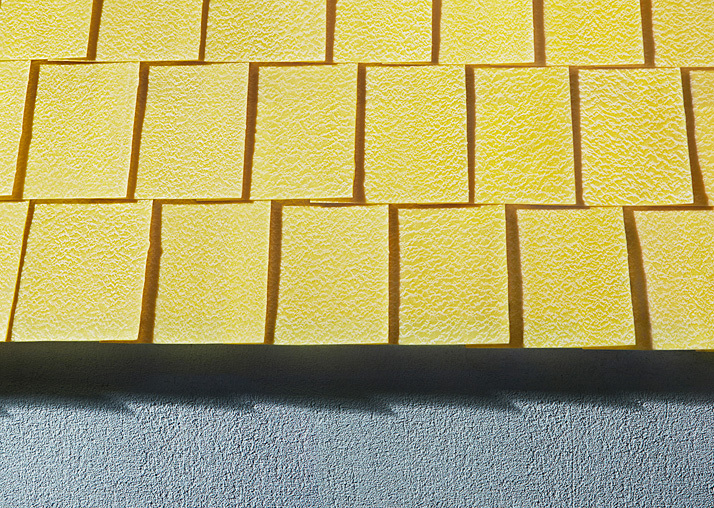 Apart from being a creative cook’s dream ingredient to work with, Italian pasta, as we know it, can be a creative team’s favoured construction material as well. On Yatzer, in the past, we’ve seen beautiful projects that take pasta out of its original context in, for example, the pasta carpet by We Make Carpets. However, we recently came across a masterful usage of the staple of Italian cuisine, once again, not for edible reasons but for visual poetry’s sake, in the latest issue of The Gourmand food and culture journal. photo © The Gourmand, issue No3. 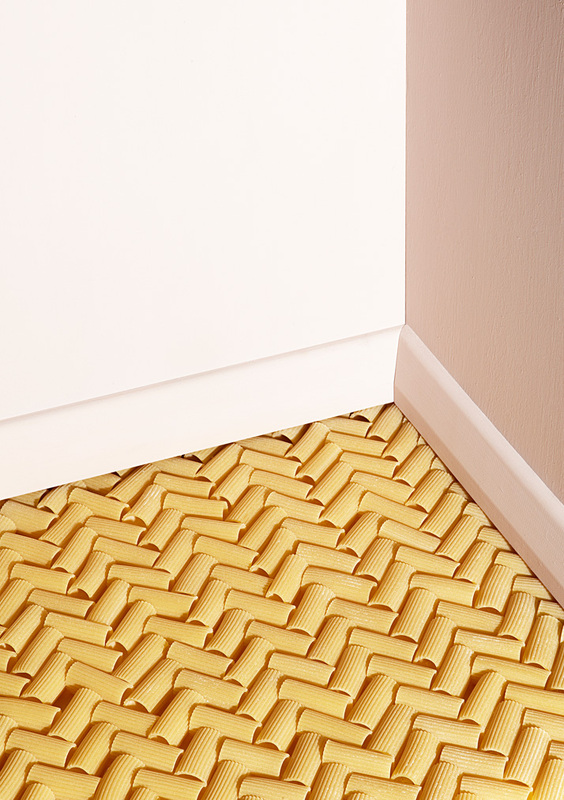 Pavimento parquet, Rigatoni // photo © Aaron Tilley, The Gourmand issue No3. 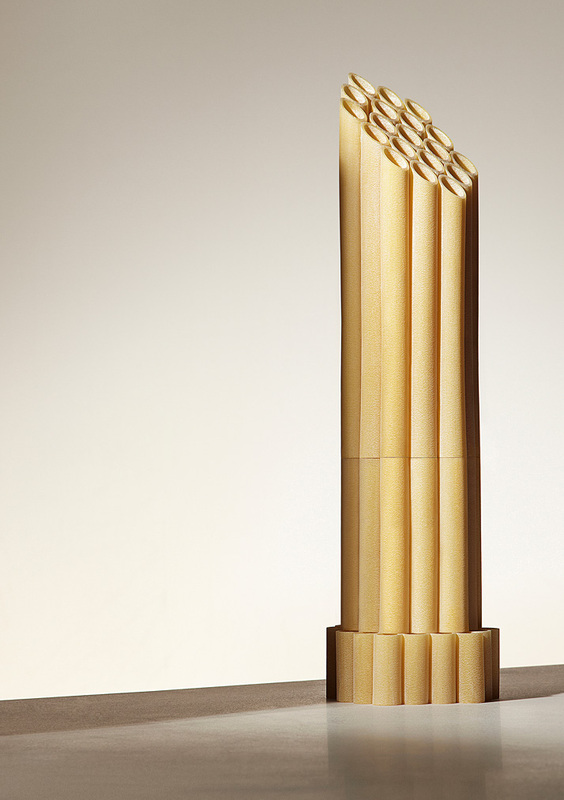 Under the Italian title ''Tradizione, Costruzione'' (Italian for ''Tradition, Construction''), set designer Gemma Tickleand photographer Aaron Tilley, both based in London, joined forces to create five different settings made of five different types of pasta, paying homage to Italian architecture. The final result is a photo series which depicts the brittle beauty of structural and decorative architectural elements. 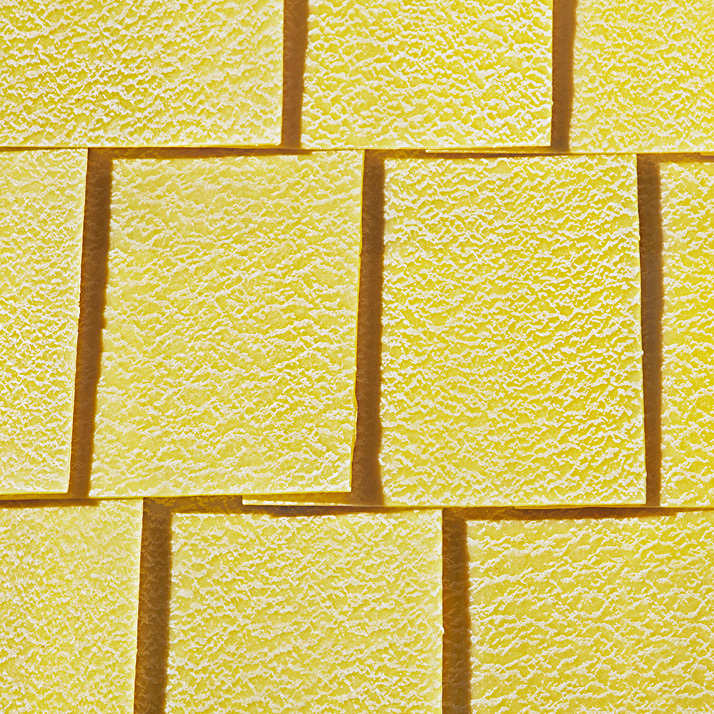 A unique curtain is created through hundreds of hanging black-sepia spaghetti, a Roman column is formed by cylindrical candele pasta, a tiled roof is made of wide-flat lasagna, a bunch of long-thin spaghetti shape a staircase and dozens of small rigatoni form a trackless herringbone-shaped floor. 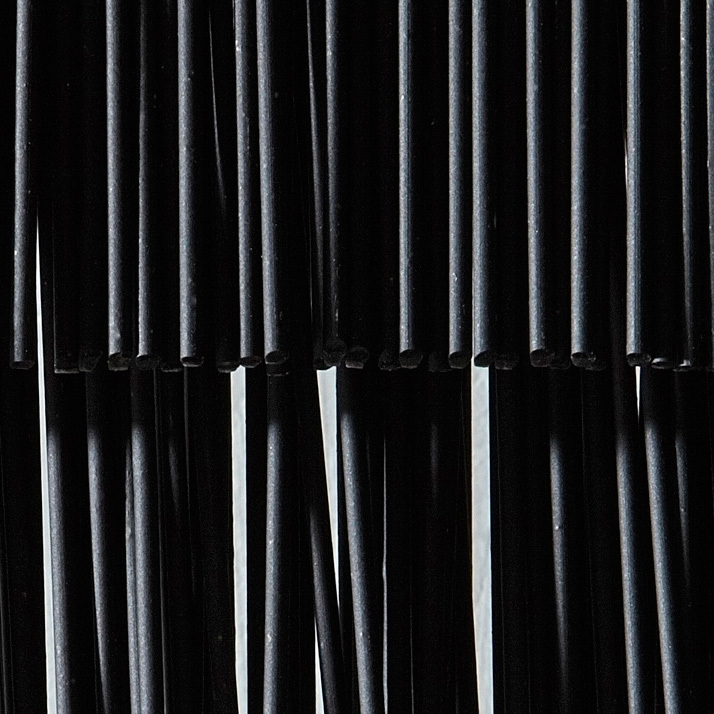 Sipario, Nero di seppia // photo © Aaron Tilley, The Gourmand issue No3. 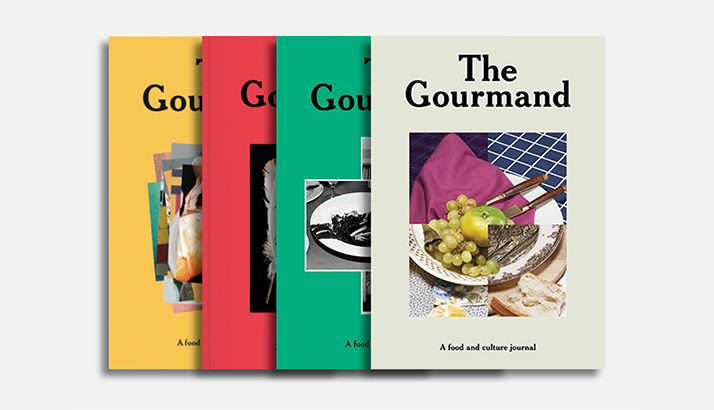 The Gourmand food and culture journal is the brainchild of David Lane, who is both the art director and co-editor in chief with his partner Marina Tweed. Its name stands for ''the person who takes pleasure and interest in food of all kinds'' and its content offers delicious-voyeurism by communicating the power of food and its inherent relationship with the arts. The magazine is published three times a year and draws together multi-talented contributors such as Rod Stanley, the former editor of Dazed & Confused, Paul Teasdale of Frieze magazine, Patrick Baglee, one of the regular judges and speakers at the D&AD Awards and Sam Bompas, the co-founder of the famous Bompas & Parr jellies. The magazine is available online as well as at some of the most prestigious international newsstands in the world, from London’s Somerset House to 10 Corso Como in Milan and from The Beast Shop in Shanghai to MoMA PS1 in New York to name a few. So what are you waiting for? Dive right in and taste The Gourmand for yourself. 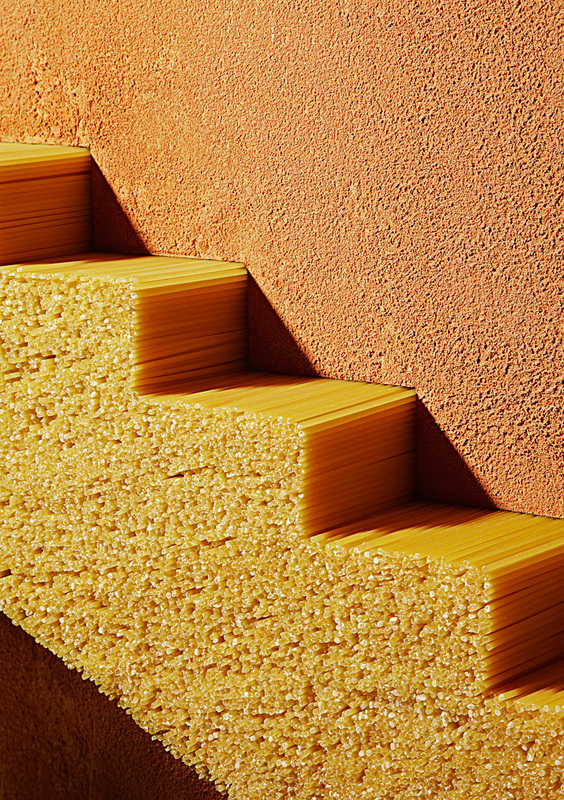 Scale, Spaghetti // photo © Aaron Tilley, The Gourmand issue No3. Tegole, Lasagne // photo © Aaron Tilley, The Gourmand issue No3. 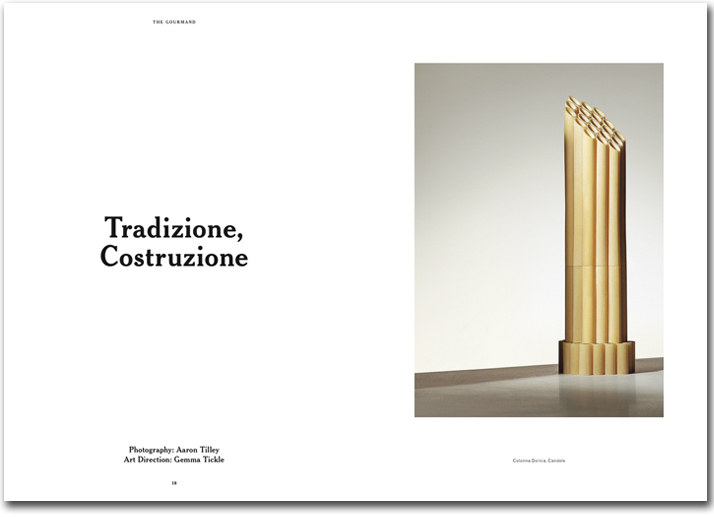 Colonna Dorica, Candele // photo © Aaron Tilley, The Gourmand issue No3. 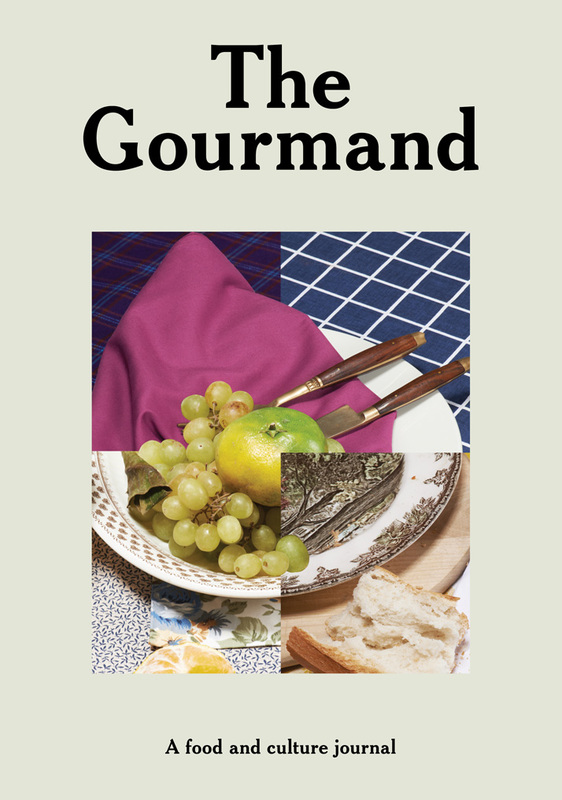 The Gourmand issue No3. Photo © The Gourmand.